The Brushy Point Lakehouse and Cabin are situated on 100 acres of lakefront with spectacular views across the lake to the ocean. NB - Please confirm prices with owner for quotes on Lakehouse, Cabin or both. Discounted rates are available on off peak dates.The site quotes on the cabin only. Please note that during peak times (eg Christmas) the Lakehouse and Cabin must be booked together. An $800 Bond for the Lake house & $250 for the cabin applies. $75 cleaning fee applies. Just across the road is the Wallingat National Park - drive up to the Whoota Whoota Lookout, with far-reaching views over the coast, the long stretch of Seven Mile Beach to Forster and the islands of Wallis Lake. In Booti Booti National Park at Elizabeth Beach 5 mins drive away, beginning at the north end of Elizabeth Beach, is a lovely 7- kilometre bushwalk, running over the cliffs to Seven Mile Beach before cutting back along the Wallis Lake front.On the west shores of Wallis Lake, Pacific Palms in The Great Lakes District. 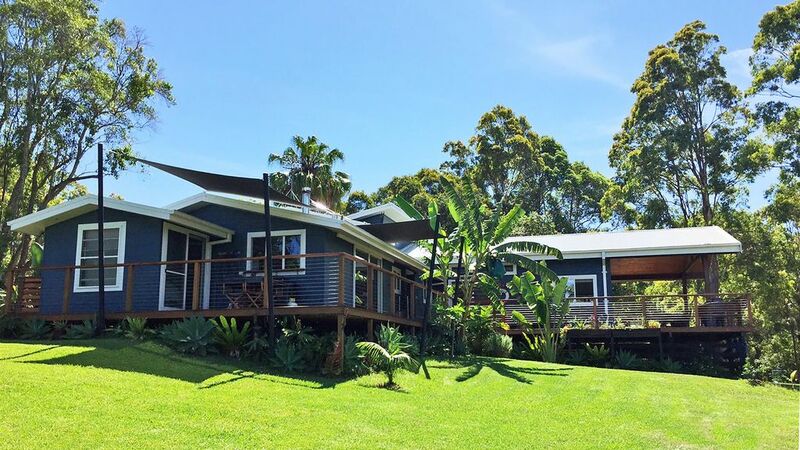 3- 3.5 hours from Sydney 10 minutes from Blueys & Boomerang beaches, 20 mins north of Seal Rocks & the Myall Lake, 25 mins south of Forster & 5 mins from the Wallingat National Park. Turn off The Lakes Way onto Coomba Rd travel 5.4kms take a right at the flags 1km drive through the casurina forest to the Point.